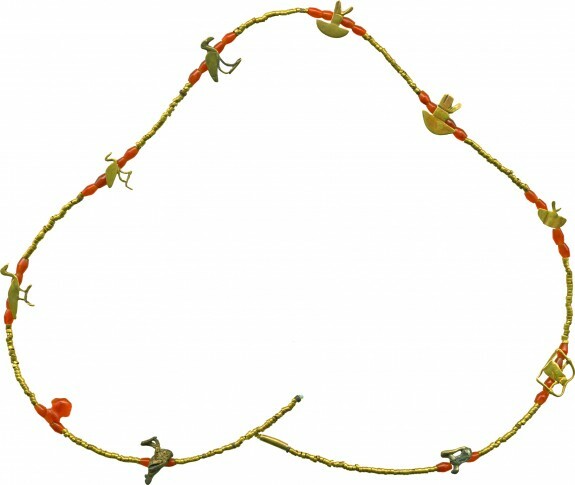 Description This (restrung) necklace consists of biconical carnelian beads, beads of rolled strips of sheet gold, and ten amulets. The rooster and couchant animal at either end of the necklace, cast of a pale yellow metal, probably do not belong. Below the rooster at left is a tiny heart amulet of carnelian. The other amulets are cut out of sheet gold of varying thickness and have rolled sheet gold loops attached to the back. Below the couchant animal at right is an amulet showing a man holding palm branches, which symbolized "millions of years." The six remaining figures are hieroglyphs as well. The three birds at left probably represent the sacred ibis of the god Thoth although the long body of one and thick bill of another seem more appropriate to ducks. Two amulets show the double crown resting on a basket, which signified royal power in Upper and Lower Egypt. Another basket amulet has something protruding from it.